Reference: Vaughan, D.; Grutter, A.; Hutson, K. (2018). Cleaner Shrimp are a Sustainable Option to Treat Parasitic Disease in Farmed Fish, Scientific Reports volume 8, Article number: 13959. https://doi.org/10.1038/s41598-018-32293-6. Many people fear medical professionals. Between the shots, the tests, and the ice-cold stethoscope some occasionally question if these shenanigans are doing more harm than good. Scientists at James Cook University in Australia pondered if fish felt the same way about the tiny sea paramedics known as cleaner shrimp. Researchers analyzed the unique relationship between cleaner shrimp and fish in a recent study led by Ph.D. student David Vaughan and Dr. Kate Hutson of the James Cook University Center for Sustainable Tropical Fisheries and Aquaculture. The symbiotic relationship between cleaner shrimp and fish in the wild has been well documented by the scientific community. Vaughan and Hutson’s study sought to determine whether fish and shrimp raised in captivity would mimic the behavior of their wild counterparts. Using high-definition cameras, the team examined the interactions between farm-raised grouper and four species of cleaner shrimp (Lysmata amboinensis, Lysmata vittata, Stenopus hispidus, and Urocaridella antonbruunii). The relationship between cleaner shrimp and fish is mutually beneficial in theory. By eating parasites off of fish, the cleaner shrimp gets a tasty snack and the fish leaves with a clean bill of health. It’s a win-win, right? Not always. The researchers quickly discovered the relationship between cleaner shrimp and fish was more tumultuous then they originally imagined. Shrimp lie below fish on the food chain; as a result, their clients occasionally ended the cleaning session early to indulge in a quick snack. The team wondered if the tension between the animals stemmed from an overindulgence of the shrimp, resulting in additional damage to the injured grouper. However, further inspection of the groupers proved that the shrimp not only avoided agitating existing injuries but also reduced the risk of secondary infection. “Injuries in fishes are susceptible to invasion by secondary pathogens like viruses and bacteria, and the reduction in redness by shrimp indicates that cleaner shrimp could reduce infections,” said Vaughan. All four shrimp species reduced the parasitic infestations. The peppermint shrimp (Lysmata vittata) had the greatest success rate, reducing infestations by 98 percent. Understanding the relationship between these creatures is a vital step in making fisheries greener. “Between 30 – 50% of farmed fish in Southeast Asia, the largest fish producing region in the world, are lost to parasites,” Vaughan said. “Shrimp clean parasites from fish, and if we can identify a species that does it efficiently, and does no harm, it offers a ‘greener’ alternative to chemicals,” he said. Chemical treatment is the most common form of parasite control in fisheries across the globe. Alternative biological solutions prevent the unnecessary addition of chemicals and stop the creation of antibiotic-resistant parasites. In recent years, forward-thinking aquaculture specialists have opted to use cleaner fish as an alternative to added chemicals. Issues arose when cleaner fish developed the same parasitic infestations as the original hosts. 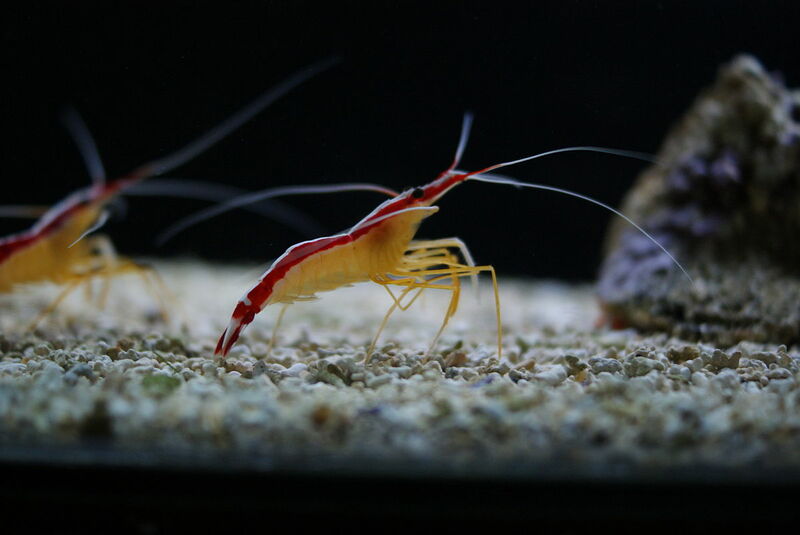 Cleaner shrimp have proven to be a more sustainable cleaning crew because they are not susceptible to the parasites. The success of Vaughan and his colleagues’ study supports further investigation into the practicality of using cleaner shrimp as a biological parasite control. Only one question remains. Why does the grouper occasionally eat the cleaner shrimp? Maybe it is simply in the fish’s nature, or maybe grouper truly hate visiting the doctor.